I like to think that I occasionally put together interesting and persuasive charts on fiscal policy. For instance, I think it’s virtually impossible to make a credible argument for tax hikes after looking at my chart showing how easy it is to balance the budget with modest spending restraint. 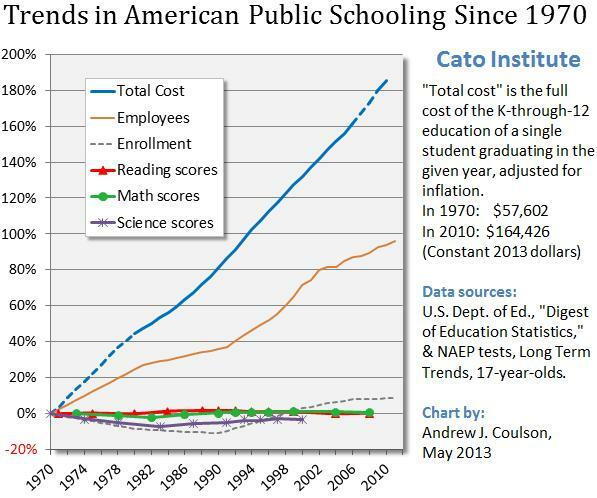 But I’ll freely confess that no chart of mine can compare to this powerful image created by my Cato colleague, Andrew Coulson, which shows how spending and staffing for the government school monopoly have exploded while enrollment and performance have been stagnant. As far as I’m concerned, no honest person can look at his chart and defend the current system. But some folks may need some more evidence about the failure of government schools, so let’s look at stories from both ends of America. We’ll start on the east coast. Writing for the Daily Caller, Eric Owens reports that bureaucrats in a New Jersey town are being handsomely rewarded for not educating students. Only 19 students in the public school system in Paterson, N.J. who have taken the SAT scored high enough to be considered college ready, local Fox affiliate WWOR-TV reports. At the same time, 66 employees in the Paterson school district each soak taxpayers for salaries of at least $125,000 per year, the Paterson Press reports. …Paterson is no tiny town. It is, in fact, the third-largest city in New Jersey. The population is roughly 146,000 people. …The city boasts some 50 public schools altogether. There are over 24,000 total students in all grades. But the folks in Paterson can be proud of their government schools. After all, they’re doing much better than Camden. In December 2013, Camden’s then-new superintendent of public schools announced that only three — THREE! — students in the entire district who took the SAT during the 2011-12 academic year scored high enough to qualify as college-ready. Last but not least, the story notes that the school district has concocted a clever strategy to avoid any more embarrassing stories. You’re probably wondering whether this means school choice? Rigorous standards? Better discipline? Nope, nope, and nope. Remember, we’re dealing with government bureaucracy. Back in Paterson, school officials say they have cleverly dealt with their nearly complete failure to prepare students for college entrance exams by no longer using the SAT to assess student achievement. I actually hope this is a joke, though there’s no indication in the story to suggest the reporter is being satirical. So we have bureaucrats getting vastly overpaid in exchange for not educating kids. Now let’s travel to the west coast, where Los Angeles schools also have overpaid officials who do a crummy job of educating students, but they have figured out very novel ways of squandering tax dollars. As Robby Soave reports in Reason, the LA school district first tried a failed scheme to give every student an iPad, which led to predictable fraud and misuse with no accompanying educational benefit. Now they want to double down on failure with a new proposal that gives various schools the option of which bit of high-tech gadgetry to mis-utilize. Who could be against choice? That’s the argument Los Angeles school district administrators are now employing to push their latest round of expensive technology upgrades. Schools will be given the choice to receive Chromebooks instead of iPads—and some schools will get laptops, the most expensive option of all. …The idea is to eventually place such a device in the hands of every child in the district. Needless to say, there’s no strategy for avoiding the mistakes that plagued the earlier scheme. The problem administrators encountered when rolling out the iPad plan, however, was that kids kept losing or breaking the devices. What happens then? Do parents pay, or does the district? Do kids get a replacement? Teachers also struggled mightily to incorporate the technology into their lesson plans, and concerns about kids using iPads for unsanctioned purposes caused headaches. The initial iPad deal unravelled after allegations of an improper relationship between then District Superintendent John Deasy, Apple, and curriculum company Pearson. The reporter is understandably skeptical about what will happen next. I have little reason to believe that the individual schools will be more responsible stewards of the taxpayer’s money than the district was. Indeed, 21 schools decided to go with an even more expensive option: laptops. Steve Lopez of the LA Times argued persuasively in October that the iPad fiasco was a costly diversion from the district’s real problems. Schools can’t even find the money for math textbooks, but administrators want to force unneeded technology on them and impose computerized tests. The district should prioritize basic instruction before deciding to purchase thousands of fancy gadgets. Gee, it’s almost enough to make you think that government schools don’t work very well and that we should instead allow parents to have real choice over how to best educate their children. P.S. You won’t be surprised to learn that Obama’s silly common core proposal appears to be driving some of these bad results. P.P.S. Though remember that Bush’s no-bureaucrat-left-behind scheme was also a flop. P.P.P.S. School choice doesn’t automatically mean every child will be an educational success, but evidence from Sweden, Chile, and the Netherlands shows good results after breaking up state-run education monopolies. And there’s growing evidence that it also works in the limited cases where it exists in the United States. P.P.P.P.S. Or we can just stick with the status quo, which involves spending more money, per student, than any other nation while getting dismal results. P.P.P.P.P.S. This is a depressing post, so let’s close with a bit of humor showing the evolution of math lessons in government schools. P.P.P.P.P.P.S. If you want some unintentional humor, the New York Times thinks that education spending has been reduced. I pay thousands of dollars in property taxes each year… the majority of that money goes to the local school system… I was in Wal-Mart… and I asked the pretty young red-head cashier to add an hour to my calling card… she asked me how many minutes were in an hour…. I was told by another young woman that one of her fellow employs at Mc Donald’s thought a senior discount was for seniors in hs…. we are spending huge amounts of money…. for nothing… it’s political crap…. it doesn’t matter how much money we spend per student per semester…. it’s not going to make the kids any smarter… or change the culture they live in…. Clearly the conservative Daily-Floggings-of-Teachers-and-Students-Will-Continue-Until-Morale-and-Test-Scores-Improve programs are not working, even with the new, much more expensive whips. Why not do what Reagan recommended? Keep local control, work nationally to increase teacher pay and help professionalize teaching, boosting unions and professional qualifications? When the king wanted to get his son ready to rule the world, he got the best teacher possible and paid him hansomely. So Aristotle was one-on-one with Alexander. Sometimes we shouldn’t ignore the lessons of history, even when they’re not on the Big Testing Company test. 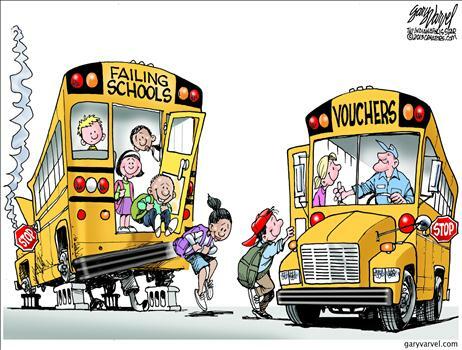 Two aspects to genuine school choice need to be raised. Accreditation is the great driver of cultural poison/pursuing John Dewey’s vision in education. All choice HAS to reign in their current authority or the poison goes with the student. Secondly, as an attorney who understands both contractual language and where the dangers are in educational policies and instructional practices, I could write a solid academically-oriented charter. Many though have unappreciated language that locks in a non-academic focus. Instead, the emphasis is on changing the student’s values, attitudes, and beliefs and real world skills. I used to think that was just the charters I had encountered but there is federally funded research from 1988 laying out a plan to use charters to lock parents and taxpayers into that Deweyan/Change the Child template that many parents had rebelled against in the past. Be careful so that genuine choice becomes available for all students, not nominal choice that exacerbates the problems. I’m not convinced the Cato chart addresses whether there’s a need for tax hikes or not. In my home state of WA, our largest problem is decades worth of underfunded infrastructure, a gazillion buildings in dire need of repair or replacement. That’s part of the cost of education, but it remains regardless of whether enrollment and scores go up, down or stay the same. The school employees aren’t construction workers, and new buildings aren’t free.